John Woodrow Wilson has been a painter, printmaker, sculptor, and illustrator. Like many African American artists, he faced the struggles of a black man in a white-dominated art culture, particularly during the 1950s when Abstract Expressionism was the “darling” of the art world. And, like many others, he became an important art educator for younger up-and-coming black artists. From the late 1960s to early 1970s, he was instrumental in setting up a visual arts program in the black community in Boston. The progress made by African American artists during the Harlem Renaissance (c1918-1939) declined markedly after World War II (1939-1945). Widespread racism and discrimination increased during the 1950s because of the Cold War and fear of Communism, which led social protest to be considered “un-American.” Many black artists continued to study in Europe because of the overall lack of opportunity in the US. The civil rights movement of the 1960s galvanized black artists to push for a revival of exhibitions and the study of African American art. By the 1970s and 1980s, many black artists were represented in major galleries and museums around the country. Three landmark shows took place in the 1970s which furthered the study of African-American art: "Contemporary Black Artists in America," 1971, the Whitney in New York; "Two Centuries of Black American Art," 1976, Los Angeles County Museum; and "Afro-American Artists in Afro-America," 1975, Museum of Fine Arts Boston. John Woodrow Wilson, the son of middle-class blacks from Guyana, grew up in Boston. He was encouraged at an early age to read and draw, and attended the school of the Museum of Fine Arts in Boston. He studied there through World War II (1939-1945) and earned a fellowship to study in Paris 1948-1949. The greater lack of discrimination against African Americans impressed him in Paris, and his teacher was the great cubist Fernand Léger (1881-1955). He also studied in Italy and was greatly impressed by the early masters of the Italian Renaissance. 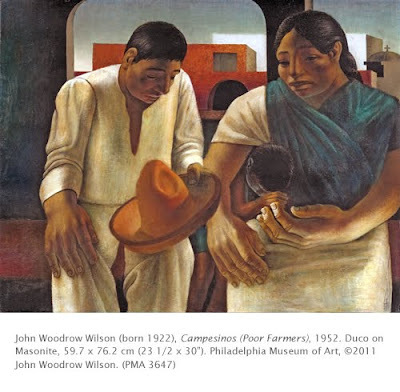 Between 1950 and 1956 Wilson lived in Mexico, where he was influenced by the Mexican mural masters Siqueiros and Rivera. The large, simplified figures in Campesinos also reflect the influence of Léger’s large, cubist figures, and the ancient Mesoamerican sculpture that influenced figures of the Mexican artists. Wilson did many works concerning the poor people of Mexico, reflecting his background with the underprivileged African Americans with whom he had lived in the US. From the late 1950s on, Wilson devoted himself to art education, particularly in the black community. In the 1980s he produced a sculpture of Martin Luther King, Jr for the US Capitol.